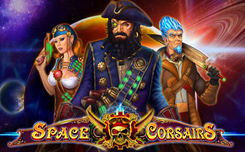 Space Corsairs slot, has five reels and 15 paylines. The main characters of the slot are pirates who are looking for easy money. The game turned out to be very entertaining, and various functions make it very interesting. Symbol wild, replaces other pictures, except for the scatter and bonus. He also participates in the Black Hole bonus. Three or more scatter symbols start free spins. They can be fifteen, twenty or twenty-five. Spins can be enlarged. Bonus appears only during the free-spins. Three or more prize pictures start a bonus round. Black Hole starts when the Wild symbol is in the middle position on the second reel. Payments are made for the combinations formed, and then all the pictures move clockwise one position around the Wild. So it repeats up to seven times in a row. Bonus Game – On the additional screen will appear planets. You need to select them in random order, and receive prizes. Beautiful graphics, interesting themed bonuses, free spins, convenient control system – all this is the advantages of the slot.